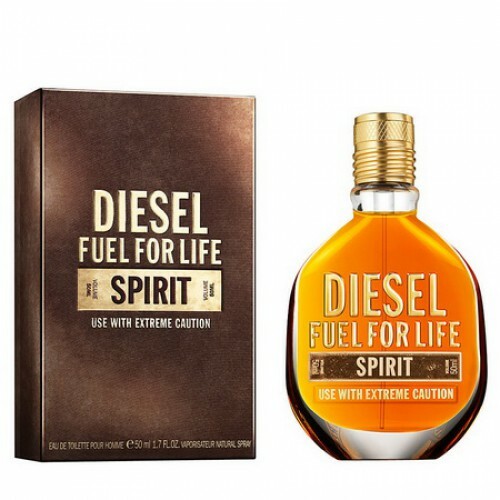 Diesel Fuel for Life Spirit is masculine, mysterious and sensual. 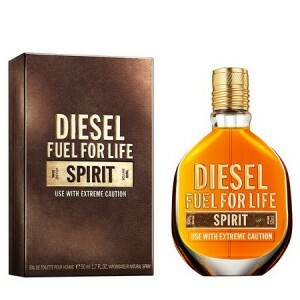 Diesel Fuel for Life Spirit 75ml. Eau De Toilette - Mysterious perfume for men " Fuel For Life Spirit "from the brand Diesel Italy was released in 2007 published a bright new flanker for energetic people who want to breathe, to feel a passion for life. Eastern composition created by perfumer. Among the initial chords predominate cinnamon and fresh notes of grapefruit flower in the "heart" - notes of iris and orange blossom, they are replaced by base notes of incense and amber wood. Perfume Fuel For Life Spirit have amber colored glass vials on the embossed letters (name perfumes and trading mark). Color cork on the bottle - a fiery gold. On-aphrodisiac fragrance Fuel For Life Spirit engraved "use with caution" that emphasizes the mystery flavor. Men's fragrance can be purchased in bottles of 50 ml, 75 ml and 125 ml. Masculine, mysterious and sensual - this is as described in "Diesel" his latest fragrance Diesel Fuel For Life Spirit. Release is expected in April. Worked on the composition Fabrice Pellegrin, perfumer, whose portfolio is perfume for Agonist, Azzaro, Diptyque, Hermes, Paco Rabanne, Roberto Cavalli and many other brands. Oriental-fern mix meets citrus freshness of grapefruit, which is shaded with cinnamon. Flower heart woven of orange blossom and iris, while the base is dominated by nuances of incense and amber wood. Concentration of Fuel For Life Spirit. The composition of new items created by perfumer Fabrice Pellegrin. She is described as "fiery" Eastern goblet with fresh citrus start, floral heart and woody base. The fragrance opens with accords of grapefruit and bitter-sweet cinnamon. At its heart - orange blossom and iris, while the base consists of amber, woody notes and incense.